Gone are days when web browsers were just limited to browsing web! So, there is no question if someone is way too careful when it comes to choosing a web browser to use in his/her computer. Actually, if you are going to spend a lot of time using a browser, you can, and you should, spend enough time in finding the best web bradowser for you. Of course, each browser comes with a bunch of capabilities — which will be suitable for different purposes. If you were looking for the best web browsers for Windows, you can stop your search here. 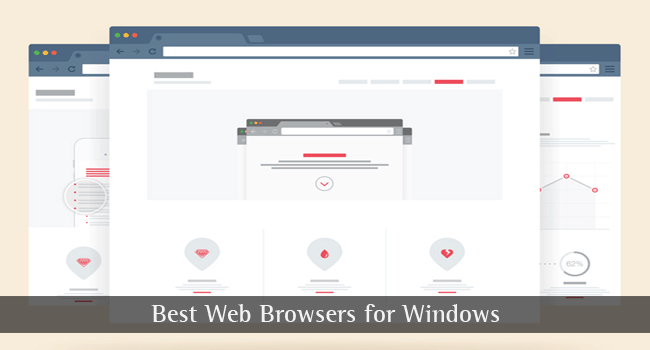 In this article, we shall list out the best web browsers you can have in your Windows PC. Along with that, we will tell you the noteworthy features of each browser and the purposes you should use them for. So, shall we start? Even so, it should be the personal or professional needs that help you take the final decision. First up, we have Google Chrome, which is the most popular and most used web browser you can find for Windows. A utility software developed by Google, Chrome has managed to become a big enough platform, for which apps and extensions are widely developed. There are regular updates awaiting you in Google Chrome, in terms of features and looks. For instance, the latest Chrome update brought the Material Design UI into the browser — a quite productive visual overhaul. Google Inc makes sure that the browser is regularly kept safe from threats and vulnerabilities and a set of newer features are also introduced in the course of time. Talking of the features, the best one is the integration with Google services. You can connect your Google account to Chrome for having a better experience with services such as Gmail, Google Plus, Google Drive, Google Now etc. And, since Chrome is available in different platforms, you can have multi-device bookmark syncing, multi-device history and even real-time tab syncing. Other notable features of Google Chrome, as one of the best browsers for Windows, include multi-user interface, an impressive collection of extensions and apps (we had, in our last article, covered the top Chrome extensions for productivity), an incognito mode for anonymous browsing, etc. These having said, as long as you are using Chrome, you’re under surveillance by Google, and there is no way to get rid of that. In addition, Chrome is said to be consuming an enormous amount of resources, which is literally a curse. Started even before Chrome, Mozilla Firefox has been the open source choice of professionals and common users to browse web and go beyond browsing. Being an open source product — for which there is the contribution of Mozilla Foundation —, Firefox is said to be a combination of lower resource consumption and an advocator of web privacy. Since the browser is not owned by any commercial firm, your data and your browsing would be as safe as possible. As we discussed in the case of Chrome, this browser is also offering the best options of regular updates and security patches on time. 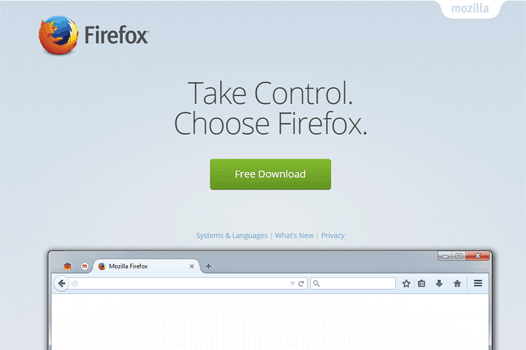 There are several reasons why people prefer Mozilla Firefox to Chrome and other browsers. The first thing is that the browser is quite lightweight and there’s not a dangerous level of energy consumption. That having said, you’ll never have to question the performance of the browser. Several productive plug-ins are available in the console and having its base in Gecko engine, the page rendering is quite impressive. Mozilla Firefox browser is available for the different platforms including iOS, Android, Linux and Mac, along with Windows. So, you have all the perks of bookmark sync. In addition, if you are a developer, chances are high that you would love features such as Firebug and Error Console. There aren’t many disadvantages to talk about in the case of Mozilla Firefox. It’s surely one of the best web browsers for Windows PCs. You know why we don’t list Internet Explorer in the article of top browsers for Windows. However, according to the current scenario and particularly considering the launch of Windows 10, we cannot exempt Microsoft Edge from this list. Microsoft Edge is the in-built web browser of devices that are running Microsoft Windows, and it’s perhaps one of the best features of this latest OS from Microsoft Corporation. Along with the power of native integration and the knowing-the-core development, Edge has been packed with several useful features, making it a notable competitor for Chrome, Mozilla and others. In our earlier post, we had covered the top features of Microsoft Edge. Being a tool that is stuffed by default, Microsoft Edge can offer improved page loading speed and other performance boosts. The most-noted feature of Microsoft Edge is Cortana, which is the digital personal assistant in Windows 10. This has been successfully integrated with the web browser, as to make browsing quicker and productive. Also, the features include Reading List — which helps you save articles or other content for later reading — and Reading View — which offers a non-clumsy environment for reading articles. Microsoft has taken care of the security aspect by exempting ActiveX and other scripts from having direct access to the browser architecture. 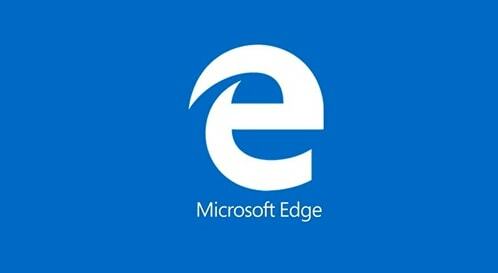 As of now, there are no extensions available for Edge. Edge is not available for the previous versions of Windows. If you want to get that, you need to run Windows 10. It’s to be noted that the lack of extensions may be a problem for the advanced user in you. Dubbed as the fast & safe web browser, Opera has a secured place when it comes to the list of top web browsers for Windows. However, it needs to be noted that the browser is available for different devices and you have all options for multi-platform browsing experience. 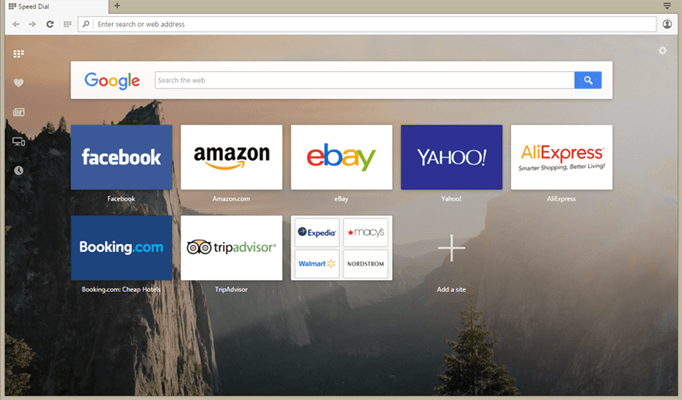 Opera may not have a bunch of stunning features to offer, but the browser is quite impressive from the common user’s point of view. It makes use of the WebKit rendering engine, which is the choice of Chrome as well. So, you can have the boost of performance that you’ve been accustomed in Chrome. Apart from these, Opera browser has some exclusive features too. Talking of the browser-oriented features, you have almost everything. There’s the availability of custom extensions and apps, multi-tab browsing management, full-screen mode for a complete browsing experience and the private browsing mode. Another noteworthy feature of Opera browser is named Opera Turbo. When enabled, this will boost the page loading process; so, even when you have a low-configuration PC, Opera would perform well. Speaking on a personal note, we love the navigation aspect of Opera very well and there are enough options for secured browsing as well. In addition, when we add features such as Visual Bookmarks and Opera Feed, it becomes the most simple and best browser for Windows. 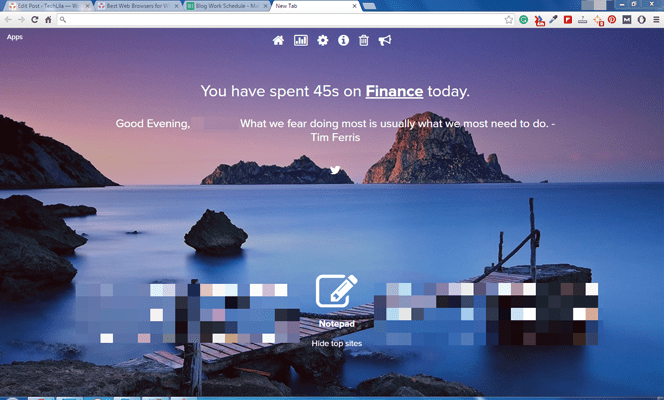 For those who believe in the simplicity of stuff, Opera Browser would do the job. Plus, there are extensions and user-productivity-oriented features to help you. If you want the best browser to have the best and practical features, you should check out Vivaldi, which is a brand-new web browser in the warfront. You may not have found this in the other top list, but we had our hands on Vivaldi and the performance was no less than amazing. Centralized control is what makes Vivaldi different from other web browser in the area. You can have a well-customized and tailored browsing experience with the stunning options. It’s worthy to have a look on the productivity-oriented features of Vivaldi browser. Despite the feature-richness, Vivaldi web browser is quite lightweight. First of all, there’s Quick Commands feature, which lets you access all the sections of web browser in one click. In F2, you have everything — from the most visited pages to bookmarks and settings panel to notes you’ve saved. Along with that, you have better tab management, thanks to Tab Stacks and Tiling. Other notable features of Vivaldi are its adaptive interface, synchronizing options to get the same bookmarks and content across different computers and an integrated Email client. With all these, Vivaldi is not only user friendly but also capable of transforming entire browsing habit of yours. Vivaldi is for those who need an extra bit of productivity and feature richness. The lightweight browser is superb to go for. 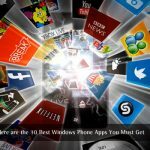 So, we have seen the five best web browsers for Windows PC. It is a fact that each browser is suited for particular needs. For instance, if you want a better integration with Google services and Material Design, you may choose to go with Google Chrome. On the other hand, if you are looking for better performance and native support from your Windows 10 PC, it’s better to stick on with Microsoft Edge. The other options — Firefox, Opera and Vivaldi — can be choices if you want security, speed and productivity for the browsing habits. As we mentioned in the introduction, it is the personal purpose that makes the final decision. Anyway, wish you happy browsing. All the browsers are just awesome. Chrome seems to be many people’s first choice, I also liked chrome but I prefer firefox more. Just love Mozilla. Chrome is the best browser and is used by majority PC users right now. I don’t really understand why a corporate as big as Microsoft doesn’t do enough testing before launching something as critical as browser, especially when you know you are competing with heavyweights like Google Chrome. You rightly mentioned that windows 10 have Cortana and edge combo but what good will it be when functions don’t work seamlessly. I am trying my hands on opera on my smartphone and discovering few things that I have not experienced before. For now – chrome stands out as best. I found your post as good and well written. There is no doubt that Chrome is the best among bests for Windows browsing. But have you guys noticed that Chrome has been very inconvenient in fixing out many ERROR ISSUES? Issues of “This webpage is not available” seemed to be very common these days. Yes, you are right chrome is the best browser and internet explorer is great to download a new browser. But Mozilla firefox is not great than opera mini. I was using Baidu Browser a long time, but now I change my mind by choosing one of that browser you recommended in your article. Thanks For your article and I’m looking to rest of your article. Google Chrome is the best web browser it is very fast and simple to work with on many PCs. Although there are many web browsers still Chrome is the best browser on Windows. Mozilla would have been a great browser too it was little lighter as the chrome is. Pretty much used Firefox for the past 5 or 6 years. A very good browser with lots of plug-ins. Never really liked Google Chrome, and it reduces your battery life considerably on a laptop.